Smile Group's lifestyle-focused flash sales propertyFashionandyou.com, has raised $10 million (around Rs 59 crore) in its Series D round of funding from both existing and new investors. Existing investors Sequoia Capital, Norwest Venture Partners, Intel Capital and Nokia Growth Partners have participated in the round. The firm said promoter Smile Group also put in more money but did not share name of the new investor(s). Techcircle.in had first reported that the e-com venture is raising fresh funding led by the investment arm of NYSE-listed Chinese discount retail specialist VIPshop. The funds will be used to enhance the company's technology, brand building and for acquiring new customers. "We have overcome a challenging phase in the last one year and streamlined operations resulting in a lean and efficient organisation. The new funds will help strengthen the technology behind our inventory light business model, acquire more customers to bolster our flash sale dominance and build a more cohesive brand," said Fashionandyou's CEO Aasheesh Mediratta. 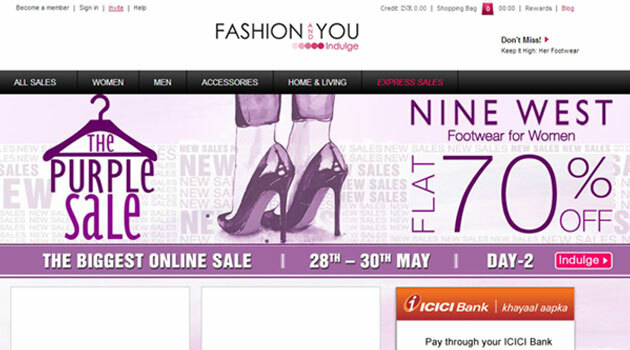 Women shoppers contribute 70 per cent of sales at Fashionandyou.com and this figure is expected to rise in the future. According to the company, the estimated growth for the online fashion and lifestyle industry is pegged at $15 billion by 2020. The rising trend of impulse purchases is likely to favour the company's flash retail model and merchandising strength, thus helping it in capturing a sizeable share of the pie. Fashionandyou was co-founded by Harish Bahl and former Yahoo India sales director Pearl Uppal in early 2010. Pearl, co-founder and CEO, Fashionandyou, quit the company last year and started her own incubator 5ideas Startup Superfuel along with husband Gaurav Kachru. Fashionandyou claims to have attracted almost 5 million members since its inception. The company deals in categories like apparel, designer wear, handbags, footwear, watches, jewellery, fragrances and home dÃ©cor. Fashionandyou competes with Myntra, which was recently acquired by Flipkart and Rocket Internet's Jabong besides Koovs, Shopnineteen, Yebhi, Zovi and DoneByNone. It had earlier raised $45 million spread across three rounds from Norwest Venture Partners, Intel Capital, Sequoia Capital and Nokia Growth Partners. Two years ago it had acquired fashion and beauty e-tailer Urbantouch.com but later shut the site.